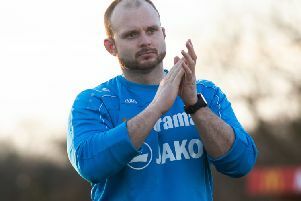 Tudors boss Dean Brennan was left to rue a lack of quality in the final third as his side were beaten 2-1 by Bishop’s Stortford at Vauxhall Road. Stortford took their chances well, while Hemel were unable to make a breakthrough until the last minute of the game when Mo Shariff netted a consolation. “They (the visitors) played really well and their goalie made good saves when he had to,” said Brennan. “When I look back at the stats count from the game, we had more clear opportunities, but our quality wasn’t good enough to win us the game if I’m being honest. Brennan felt that his side should have been awarded a penalty, but was also disappointed that they did not take the chances that fell their way. “There were turning points in the game; both teams should have had a penalty but we should have had our one when it was still 0-0 for a handball,” he said. “At the end of the first half, their keeper has made an excellent one-on-one save from James Potton and then at the start of the second half Dennis Oli got in one-on-one but missed the target. Another area in which Brennan felt his side were outplayed on Saturday was in the centre of the pitch: “They were very strong in central midfield – they were better than us in that regard if I’m being totally honest – and they defended very well. Brennan continued: “We’ve just got to move on to the next game now. We are seventh in the league but we don’t really look at the league table properly until about 12 or 15 games in - that will show us where we really are.